Founded in 1930 by "Uncle" Sam Ashley- Uncle Sam's All American Chocolate Factory (back then we were known as Uncle Sam's Candy) has been an Upstate New York Chocolate Tradition for over 80 years! We have used the same ingredients, products and recipes since the 1930s, and have only added new and exciting flavors and candies to our award-winning selection since them. The original Uncle Sams nut bark is still available yet we have added a few options like "Sea-Salted" Bark and "72% Cocoa" dark chocolate bark to the menu to reflect the times! We now have a full selection of truffles of which there are always 12 flavors and more depending on the holiday. We offer a full selection of caramels, creams, clusters, marshmallows, nougats, dipped items and more! And can you believe that we are a distributor of Jelly Belly Jelly Beans in all of their 49 flavors! We have one of the best prices on Jelly Belly beans in America! Our candy flagship item is our world famous Almond Buttercrunch, which we make in milk, dark and during the Holidays- white chocolate as well. It is different than any other made due to its thinness, crunch, and the perfect proportion of nuts, toffee and chocolate! It is the most balanced Almond Crunch anyone can taste and we have it here in 1 lb, 2 lb. 3lb. and 4 lb. boxes with free shipping on four pounds or more to one location! Check our quantity discounts as well! So go ahead and enjoy our new and vastly improved chocolate website with an easy to navigate and order Volusion shopping cart. We ship our chocolate all over America and are certain you will be amazed at the quality. Our chocolate is made with real chocolate liquor (not alcohol liquor) and cocoa butter. This is not the imitation chocolate product that people refer to as "candy melts" that are made with inferior ingredients such as cocoa powder and hydrogenated palm oil and trans-fats. Here you will find most of the products we offer in our upstate New York retail location and candy kitchen. Find out why our customers travel from Vermont, New York City, New Jersey, Massachusetts, New Hampshire and beyond to buy our delicious products.If you have any questions, or want to order or discuss anything over the phone, please call us at (518) 372-2243. We are a true "BRICK AND MORTAR STORE AS WELL." Not a fly-by-night webstore that you can't be sure of. Real people work here in our kitchen, behind our counter and in our shipping department to ensure a chocolate experience that you won't forget! If you don’t see what you are looking for, please ask! We make special items, we mold logos in chocolate, and offer discounts on items like chocolate roses, an amazing array of chocolate novelties and our specialty is corporate gifts for companies large and small. You would be amazed at how well a box of our Buttercrunch or Nut Bark goes over at Thanksgiving or Christmas with clients and business associates. We can wrap and ship and will do all the work for you too! 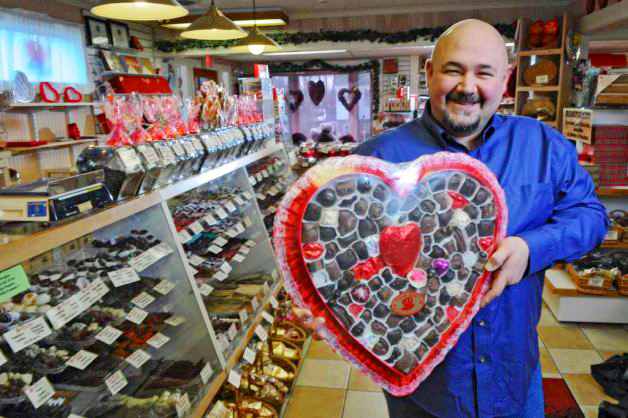 Our Owner- Joe Suhrada, with a jumbo Valentine's Heart! At times our inventories change faster than we can keep up with on the web. 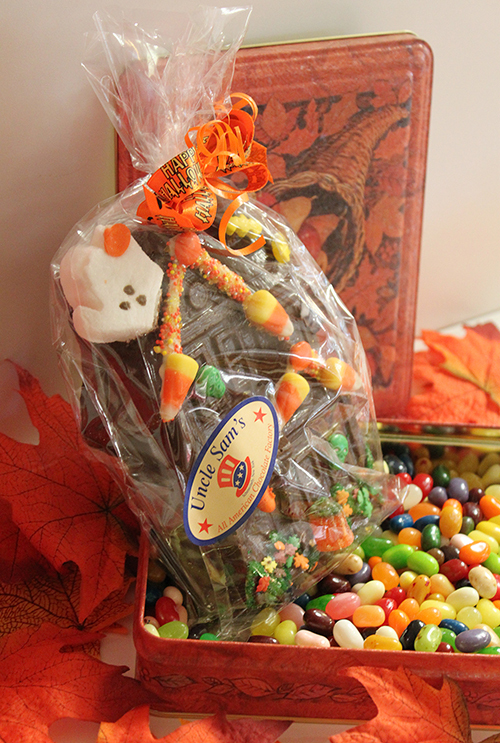 You can also email us at info@unclesamscandy.com.